This is a foreign exchange guide to Hong Kong, the Hong Kong Dollar currency plus HKD transfers and travel tips. Hong Kong Dollar exchange rates - latest & historic exchange rates. What is the Hong Kong Dollar currency code and symbol? The three letter currency code for the Hong Kong Dollar is HKD and the symbol is $. Which countries use the Hong Kong Dollar? It is the domestic currency in Hong Kong. Representing a little less than 2% of the foreign exchange market daily turnover, the Hong Kong dollar is the world’s thirteenth most traded currency. It is subdivided into 100 cents. The Hong Kong dollar has been pegged to the US dollar since 1983 and the USD/HKD exchange rate has been limited to a range of 7.75 to 7.85 since 2005. The Hong Kong dollar’s peg is backed by one of the world's largest foreign exchange reserves (Hong Kong’s official reserves in 2016 were worth US$360 billion). Hong Kong dollars are issued by the country’s government, but also by three local banks – HSBC, Standard Chartered and Bank of China – providing those banks have on deposit the US dollar equivalent of what they print. The Hong Kong dollar reached an all-time low against the US dollar in September 1983 when USD/HKD reached 9.6 (HKD/USD 0.104), and its all-time high came in March 1978 when USD/HKD traded at just 4.6 (HKD/USD 0.217). The interactive chart below shows the USD to HKD exchange rate for the previous 3 months with rate alerts for days when the exchange rate moved up or down significantly or for 30 day highs and lows. Hong Kong, the grand city with an iconic skyline, a legendary cuisine kitchens, and lush, protected nature where rare birds and colourful traditions thrive. Over 70% of Hong Kong is mountains and sprawling country parks, some also home to geological and historical gems. Escape the city limits on one of the world’s smoothest transport systems and spend your day wandering in a Song-dynasty village, hiking on a deserted island or kayaking among volcanic sea arches. Underneath the glass and steel of Hong Kong’s commercial persona is a dynamic cultural landscape where its Chinese roots, colonial connections and the contributions of its home-grown talent become intertwined. What currency should I use in Hong Kong? ATM machines or BankAutomats are everywhere in Hong Kong. You will definitely find them at the airport, cruise ports and train stations, so you can get cash as soon as you land/arrive. You will see the familiar networks like Visa, Master Card, Cirrus, EuroCard, Plus, etc. used by most international financial institutions. Instructions will be available in English which makes it easy, and the process is exactly the same as at home. Although many of the smaller shops in Hong Kong will give better prices if you pay in cash with local currency, most shops accept international credit cards, but some of the smaller ones do not. ... Readily accepted credit cards include American Express, Visa, and MasterCard. If you plan on using your credit card or ATM card, be sure to alert the bank that issued your card back home and let them know you will be travelling abroad and the dates of your trip to prevent them from blocking your account when they see any "transactions outside of normal range of activity". Getting around in Hong Kong? From the airport the Airport Express is probably the quickest and most direct way to the city, making three total stops at Tsing Yi, Kowloon and Hong Kong Stations. Visitors using the Airport Express will most likely be interested in the Kowloon and Hong Kong Stations, which are located in the main parts of the city. Sometimes the taxi queue at Hong Kong station can be quite long, so if your hotel is near to the station in Lan Kwai Fong or Sheung Wan and you're are travelling light it might be a good idea to walk through the air-conditioned IFC. While in Hong Kong consider using the Octopus Card. It is a stored-value smart card, similar to London’s Oyster card or Sydney's Opal card, that can be used for quick access and payment for public transportation as well as basic purchases at a many retail shops throughout Hong Kong such as 7-Eleven. It can be topped up any a large range of outlets, even McDonalds. Public transport in Hong Kong is excellent. There are bus routes covering most of the island, frequent ferries between the islands making up the region, The Star Ferry connecting Kowloon to Hong Kong island is a considered a must see for its views. There are trains into mainland China and the superb MTR underground railway. The city is well connected by trains and great double decker buses. The drivers usually don't speak English and be prepared to sacrifice the small change because they don't return the change for the bus tickets. The cabs in Hong Kong can be expensive. There are a few bus routes that are worth seeing too. Route 973 travels from Tsim Sha Tsui, around Kowloon, crosses the harbour and winds around the coast of Hong Kong Island to Aberdeen, Repulse Bay and terminates at Stanley Market. Up top the double decker bus this is a spectacular trip. 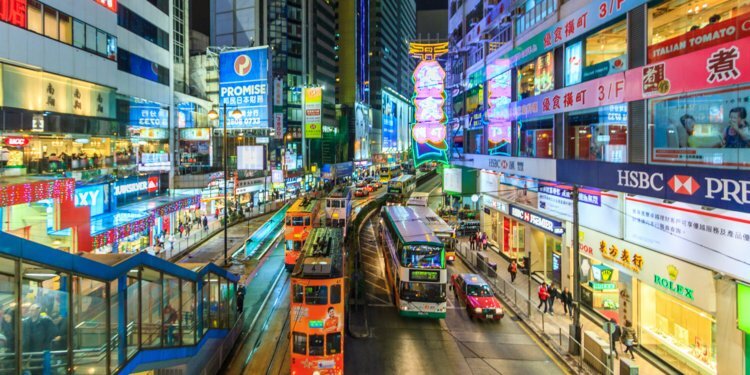 Travel tips for Hong Kong. In general, Hong Kong is a very safe city by day and night. The drinking water is often not considered drinkable depending on who you talk to so bottled water is a good idea. Many free tourist maps will also show great walks through the central city that will lead you through many popular areas and help give you a good insight to the city for first time visitors. If you prefer to stay in an Airbnb there are tons of condos for a fraction of the price available. Staying in an Airbnb will also help save money on meal costs as you can easily make breakfast before heading off exploring Hong Kong. Always always always carry an umbrella with you, the weather in Hong Kong is unpredictable. Hong Kong gets an average of 101 rainy days a year! Save money and time by Ordering your Hong Kong Dollar online from Travelex, you get better rates and can pick up the HKD cash locally or even on travel day at the airport. For card purchases if offered a choice of currencies always select to Pay in Hong Kong Dollar otherwise you may get much worst exchange rates. Compare HKD travel cash rates - probably why you are here! When searching around for information on how to get a good exchange rate when sending money to Hong Kong you need to start with finding out the latest Hong Kong Dollar foreign-transfer exchange rate. What prime property does $US1m buy in Hong Kong? The area (㎡) of prime property that $US1million buys in Hong Kong (Q1 2018) is 22㎡. This is compared to equivalent areas for Monaco 15㎡, New York 25㎡, London 27㎡, Singapore 37㎡, Paris 45㎡, Shanghai 50㎡, Los Angeles 58㎡, Tokyo 70㎡, Berlin 74㎡, Miami 78㎡, Mumbai 94㎡, Istanbul 110㎡, Dubai 138㎡ and San Paulo 172㎡. Once your funds are received by the provider the converted HKD amount will be transfered to the recipient account you specify in Hong Kong. Use our Send to HKD calculator to compare the exchange rates of FX specialist providers rates versus your bank's standard rates you can hopefully save around 5% and maybe more - end result is more Hong Kong Dollar deposited into the recipient bank account and less margins and fees kept by the banks!